We have been up at Morecambe for the last few days as it was my goddaughters 4th Birthday last week. Today, I am off up to Scarborough for a few days hopefully, weather permitting to watch some cricket. This afternoon I have been down in Salford at a meeting of Conservative Councillors and Parliamentary Candidates with Theresa Villiers MP (Shadow Secretary of State for Transport) to discuss the proposed poll on the Congestion Charge or Travel to Work Tax as it is incresingly becoming referred to. All ten boroughs from across Greater Manchester were invited and everyone had the opportunity to explain the current position in their area. The one thing that became crystal clear is that whilst the Conservatives are united in their opposition to the new tax it seems Labour are divided across Greater Manchester as to whether they support it or not. I welcome the fact that residents throughout Greater Manchester will be given the opportunity to democratically record their view. We are back from the weekend away in Edinburgh during which we attended a performance of the Military Tattoo on the Esplanade of Edinburgh Castle. It was indeed spectacular. We were fortunate that the weather was quite pleasant and we were able to enjoy the bands and fireworks without any rain which considering the floods in Belfast we were I think very fortunate. For those who wish to catch the event on television I notice highlights are scheduled to be shown on BBC1 next Saturday. Last night I attended and spoke at a meeting of Ramsbottom Conservatives.There are always a number of vitally important issues to be discussed concerning Ramsbottom and last night was no exception. Our Councillors in Ramsbottom play a full part in all the activities of the local community and there is not much that goes on in Ramsbottom that they do not know about. Earlier in the day I attended the flag raising ceremony at the Town Hall in honour of Pakistan Independence Day which was attended by the Mayor and Mayoress of Bury. I am now away for a couple of days as I am going up to Edinburgh to watch the Tattoo. This afternoon Sue and I ( and CeeCee ! ) 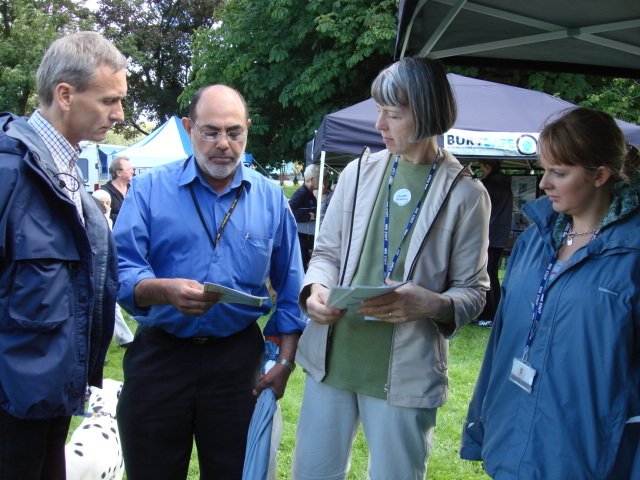 visited the Party in the Park at Hoyles Park in Chesham, Bury. 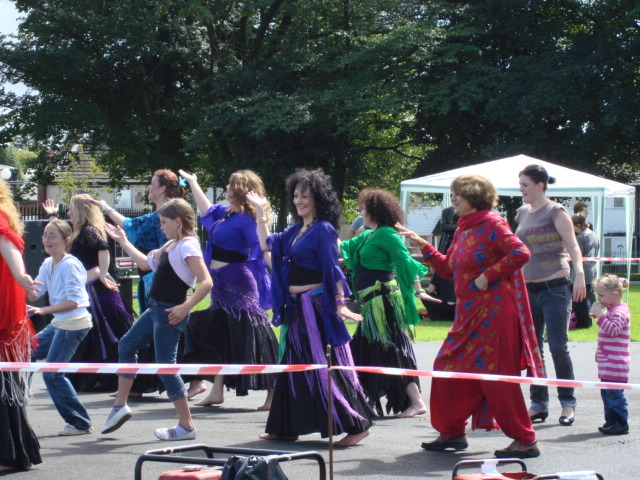 Along with the usual Council and Corporate stalls there were performances as diverse as belly dancing and martial arts! I, like millions of others, tuned in to watch the opening ceremony of the 29th Olmympic Games in Beijing. It was as spectacular as expected and it set a high standard for London to follow on 2012. As a sports fan I am looking forward to 16 days of wall to wall coverage of all the various sports many of which only receive coverage during the Olympics. It has been a quiet few days recently. Lots of people are away on holiday at this time of year. I have been able to catch up with some paperwork in the office. On Monday morning I attended the funeral service for Thea Smith the widow of the former Rector of Bury Canon Reg Smith. Bury Parish Church was full with family and friends and I found it an uplifting service. Some people commented that Thea’s death marked the end of an era. Whilst I was not in Bury to witness at first hand the “Smith era” everyone always speaks fondly of the times when Reg and Thea were in the Rectory and Thea will be greatly missed. Later on Monday, Sue and I were back at the Parish Church but this time in the Church Hall to take CeeCee to his dog training class. Although it is called dog training I always think it is more about training the owners! CeeCee used to go on a Thursday evening to the Puppy Socialisation Class but now having been for six weeks on that course he has moved up to the Beginners Class!. We are now trying to train him to sit still as he finds it very difficult to remain in one position for more than a couple of seconds we have a lot of work to do!